Mal Benning (no.3) is congratulated after scoring. 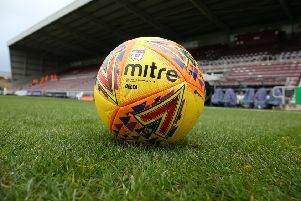 Mansfield’s automatic promotion hopes suffered a dent after they were held to a 1-1 draw by mid-table Northampton Town. David Flitcroft’s side were forced to settle for a point after a scrappy encounter at Sixfields. It was a game which lacked quality as both sides struggled to assert themselves. Mal Benning gave the Stags the lead in the first half when he scored directly from a corner. But Sam Foley’s second-half effort saw the sides share the spoils. Bury’s welcome return to form against Colchester fired them back into the top three, with the Stags dropping to third. MK Dons’ defeat at Tranmere leaves them a point shy of Flitcroft’s charges. Flitcroft made just the one change after last week’s win over Cambridge United. It was an enforced one as Ryan Sweeney replaced the injured Ben Turner. The hosts had an early chance to take the lead Aaron Pierre headed David Buchanan’s corner into the side netting. Down the other end Benning put the promotion-chasing Stags ahead as his corner sailed in. Flitcroft’s side had to be wary of Buchanan’s probing balls into the box as they protected their one-goal cushion. Tyler Walker did well to brush off their Cobblers’ defenders before his effort was blocked. 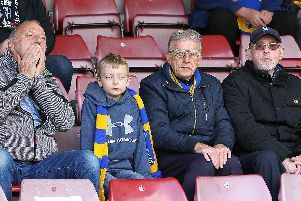 Can you spot as familiar face in our Mansfield Town fans gallery at Northampton Town? With 20 minutes remaining Foley levelled proceedings. The Irishman rose highest to head Scott Pollock’s corner home from close range. Down the other end Matt Preston’s headed wide at the back post as the Stags tried to immediately respond. Danny Rose audaciously tried to put the visitors back ahead with an acrobatic effort which was blocked. With five minutes left Rose missed a glaring chance to steal all three points. A cross was knocked into the striker’s path, but he couldn’t keep his effort down from close range. Northampton: Cornell, Facey, Goode, Pierre, Buchanan (Cox, 89), Hoskins, Turnball, Foley, Pollock, Williams, Powell (Morias, 82). Unused subs: Coddington, Elsnick, O’Toole, Bowditch, Powell. Mansfield: Logan, Preston, Pearce, Sweeney, Jones (Rose, 62), Tomlinson (Mellis, 56), Bishop, MacDonald, Benning, Walker, Hamilton. Unused subs: Smith, Grant, Law, Atkinson, Hakeem.